In last week’s Monday Tip-Off, I talked about why basketball video games need to have robust game modes. As I explained in the article, having a variety of deep, engaging modes goes a long way in making a basketball video game feel complete, and fully featured. Combined with satisfying gameplay, appealing bonus content, and a bevy of customisation options, the end result is a well-rounded, quality release. In other words, the kind of basketball video game that we all want to see and play. One of the customisation options that every basketball game absolutely must have is roster editing. 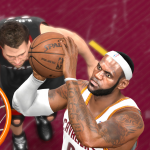 When NBA Live and NBA 2K launched on the current generation of consoles, both games were missing the comprehensive roster editing tools that were available in previous releases. 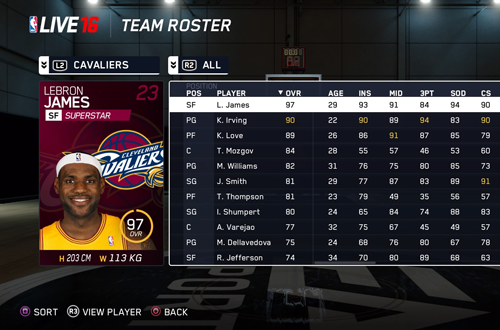 NBA 2K14 had some basic roster editing functionality, while the ability to customise rosters was completely absent in NBA Live 14. NBA 2K has since brought back roster editing, but unfortunately, it’s yet to return in NBA Live. Moving forward, it’s absolutely essential that both games offer roster editing and that the functionality continues to expand and improve. Let’s take a look at why this is such a vital feature in basketball video games. First and foremost, while post-release support for basketball video games has improved, and the official roster updates for both games are released on a regular schedule, there are times when that just isn’t enough. For example, the roster updates for NBA Live are currently released weekly, and are sometimes finalised before a flurry of moves occur, as was the case at the trade deadline this year. This leads to frustration as we end up receiving an update that is already outdated, and must wait at least another week before we can play with updated lineups. If we can edit (and share) rosters ourselves, this is a situation that we can overcome quite easily. Similarly, official roster updates can contain mistakes and oversights. I will actually defend both EA and 2K here; having maintained unofficial roster updates for many years, I’ve walked a mile in their shoes, so to speak. I can attest to it being all too easy to overlook a player here or there, or miss something when double-checking. No one’s perfect, and mistakes will unfortunately happen. Of course, when we can edit the rosters ourselves, we can quickly make corrections while we wait for the next official roster to be pushed through. Likewise, if we disagree with player ratings, or find a different dunk package to be more suitable, we can make changes accordingly. Secondly, there will come a time when official roster updates cease. Because a lot of us continue to play the most recent game in the series until the next one comes out, we usually like to update the game with offseason transactions, so that we can get a preview of what new-look teams will play like. As the once-off release of an official offseason roster update for NBA Live 14 demonstrated, it gives us something to do while we wait for a new season of the NBA and basketball gaming to tip off. Furthermore, not everyone gets the latest game every year. Unofficial roster updates allow gamers to enjoy a game until such time as they are willing and able to upgrade. Thirdly, roster customisation has also facilitated the creation of a variety of new experiences for basketball games, from foreign leagues to historical rosters. While the potential legal ramifications make it difficult for EA or 2K to openly support or promote modding, the hobby has benefitted them on occasion. Several long-time console gamers actually double-dipped with the PC version of NBA 2K12, just so they could try out the Ultimate Base Roster. Certain mods have garnered attention in the gaming media, further promoting the games (and most likely, resulting in a few extra sales). From our perspective, it’s made the games that we enjoy even more fun. Beyond modding historical teams and other content into basketball games, roster customisation also provides gamers the opportunity to do something we’ve enjoyed doing for a couple of decades now: make fantasy rosters, and put ourselves and our friends into the game. Sure, you can wheel and deal in the franchise modes, but without roster customisation, you can’t set up some interesting scenarios beforehand. Single player career modes offer an opportunity to put yourself in the game – scanned face and all – but your player isn’t available for exhibition play. Without roster customisation, we’re locked out of doing some really fun things in basketball games. Whether you want to create fictional rosters, put yourself and your friends in the game, fix a few things before you start a new franchise mode game, re-create a memorable NBA season, or devise any other kind of customised basketball gaming experience, roster customisation is a vital feature. However, I personally want to see roster editing functionality taken even further. I’d love to see in-game roster editing tools expanded to the point where an external editor isn’t even needed. That means being able to edit all of a player’s bio data, advanced ratings and tendencies, and anything else that we’ve never been able to access in-game. I’d also like to be able to assign players to an inactive list, if we no longer want them to show up in the free agent pool for whatever reason. It would be amazing if we could have a full compliment of roster customisation tools, allowing us to import custom textures, create new teams, edit all existing teams and players, and so on. Imagine the things we could do, right out of the box! It would also be fantastic if we could use the technology that’s in place for Rising Star and MyCAREER, as well as MyLEAGUE and 2K Pro-Am, in creating custom rosters. Imagine being able to create a custom team, original logo and all, and fill out the roster with you and your friends, complete with scanned faces. I think it could be a lot of fun to export your Rising Star or MyPLAYER for use in exhibition play, or one of the franchise modes. Even if fantasy, historical, or other “special” roster modifications don’t interest you, an expanded in-game toolkit would be very useful in making fixes and updates in between the release of official rosters. As far as NBA Live is concerned, getting some basic roster customisation functionality into the game is the first step. I’m obviously not expecting all of these additions to be made in NBA Live or NBA 2K within one production cycle. 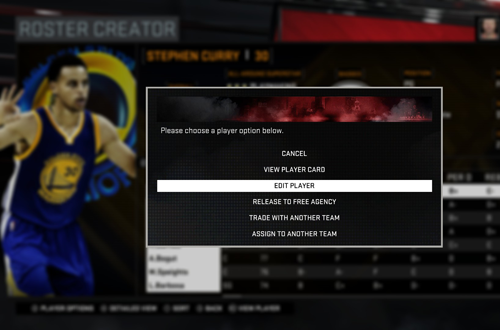 But at the very least, having some basic roster management functions – as we thankfully do have in NBA 2K – is a must. Gameplay is obviously paramount when it comes to having a quality basketball gaming experience, and deep game modes are vital to keep us engaged, but roster editing is most certainly an essential feature as well, the importance of which cannot be understated.